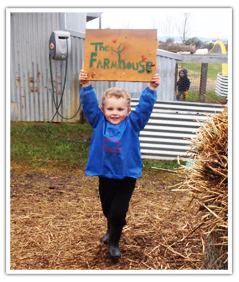 The Farmhouse provides programs for children on a full-time and part-time basis across four rooms, 7am-6pm weekdays. We offer long-day care, half-day care, occasional care, before and after kinder care, as well as before and after school care. We also drop off to and collect from all local Mansfield primary schools; Mansfield Primary, St Mary’s Primary, and Rudolf Steiner School, as well as dropping off to and collection from the Mansfield Kindergarten. The Farmhouse has a backbone of traditional values holding honesty, friendship, teamwork and community central to our way of life. We simultaneously provide a ‘modern’ service presenting quality kindhearted care by passionate educationalists, and excellent facilities complemented by age-appropriate resources. Both the Forest Schools of UK and Europe and the Reggio Emilia approach have been inspirational in how similar their intentions are to the ethos we’re striving for. A Forest School is essentially a wonderfully expansive, natural physical environment where children can experience and learn essentials for life through their proactive interaction, child-initiated discovery, within the realms of a nature-orientated program. Richard Louv, in his book “Last Child in the Woods” (2008) highlights that direct exposure to nature is essential for a child’s healthy physical and emotional development. He also cites the growing body of evidence linking the lack of nature in childrens’ lives and the rise in obesity, attention disorders and depression. The Farmhouse places the children’s well-being first and foremost, both as the child and the evolving adult that they are. We consequently provide and allow children every opportunity to enjoy and incorporate nature into their every day. The Reggio Emilia approach allows children with opportunities and time to freely experiment, explore, and play, and in turn encourage them to master the many tools and skills of communication, not only through the spoken word but also through other potent languages. These include expressive languages such as drawing, sculpture, sound, drama and movement; but also metaphorical, symbolic, communicative and cognitive languages. 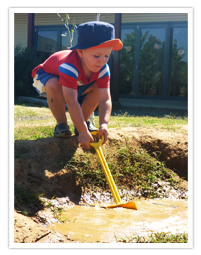 Reggio Emilia values individuality and personal development, and encourages creativity. The cohesion between Forest Schools and Reggio Emilia is in the centrality of the child, together with the importance of the community and unified with the exploratory journey through the natural world. The Child Care Benefit (CCB) is available to all families. Your CCB rate is determined by the Government and depends on your family’s annual taxable income. Families are also eligible for the Child Care Tax Rebate (CCTR). Families can now claim up to 50% of their out-of-pocket expenses up to $7,500 per child per year. For more information contact the Family Assistance Office on 13 61 50 or visit www.familyassist.gov.au.